Looking for something sturdy and stylish to store your favourite loose leaf tea in? Well look no further, we've just launched the perfect caddy filled with loose tea! These fab new Tea Caddies are the perfect plastic free option to buy and store your favourite teas in. 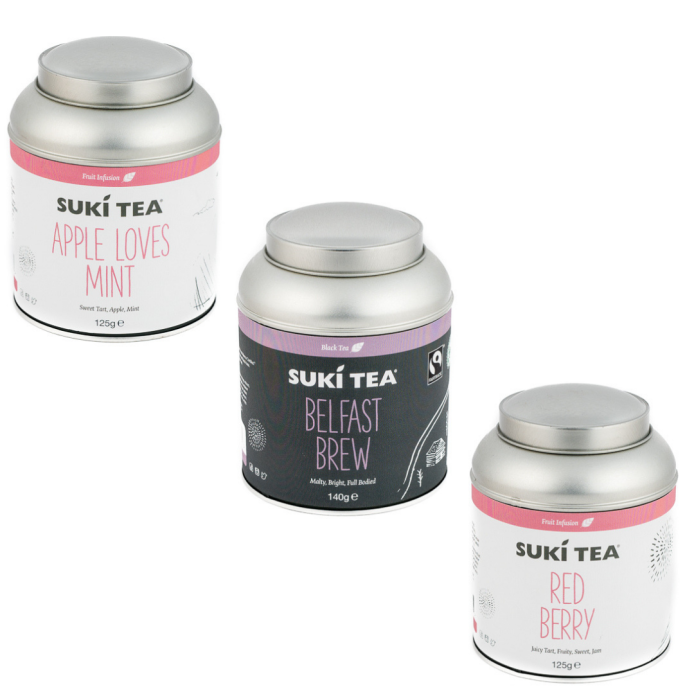 Choose from 'Red Berry', 'Apple Loves Mint' and the classic 'Belfast Brew' packed in a beautiful, giftable, airtight tin so it stays fresher, longer. An elegant and practical tea caddy which will take pride of place on any kitchen worktop and keep your tea fresh! We absolutely love these tea caddies as they are plastic-free and reusable! Just fill it up again and again! Under the pretty label, these tea caddies are embossed with our iconic sketches, a truly special keepsake. At Suki, we are very passionate about having complete respect for the planet. Single use plastic is a huge issue, our tea caddy is completely plastic free and reusable. Live better with loose tea and less waste!